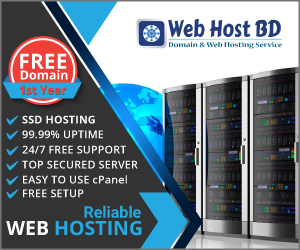 Web Host BD is a Domain hosting company in Bangladesh. We provide domain and web hosting in Bangladesh with other countries. If you need domain hosting for your website, you can take our service. We provide guaranteed, best quality domain hosting service for our clients. We are providing domain hosting service from last few years. We have many clients in Bangladesh with some other countries. Our main service goal is Bangladesh. Cause we are the best Domain Hosting company in Bangladesh. You can see some important features bellow that we provide for our clients. * We provide top level domain with low cost price. * You can order your domain by registering our website. * You will be able to pay by BDT for your Domain registration. * You will get domain full control panel from us. * You will be able to manage your domain by your domain control panel. * We provide dedicated customer support for any kind of problems. * You can use any company hosting for your domain by using our domain control panel. * We receive same domain renew price every years. * If you want, you will be able to transfer your domain from us any time. * Packages: We have some different hosting package. You will be able to choose according to your needs. We have 500 MB to Unlimited hosting package. We have divided many hosting package for our clients needs. * Disk space: We provide limited to unlimited disk space for our clients. You can choose hosting disk space according to your needs. We have divided hosting space differently every packages. * Bandwidth: We have set up monthly bandwidth differently our every hosting packages. We set up monthly bandwidth every packages. Our clients can use his all monthly bandwidth in every month. * Package Upgrade: If you need more hosting space and bandwidth, you can upgrade your package any time. If you cross your current package usages limitation, we provide next package upgrade by receiving next package less charges. * 99.9% uptime: Our hosting server has strong uptime. We provide 99.9% guaranteed uptime for our clients. You can check our server uptime to take our service. * Unlimited package: We provide unlimited usage hosting package for our clients. This package is really unlimited package. You will be able to use unlimited disk space, unlimited monthly bandwidth, unlimited email, unlimited domains etc. Only we provide unlimited hosting package in Bangladesh. * Support: We have skilled support team for our clients. We provide instant customer support for any kind of problem. Our dedicated customer support team works 24 hours and 7 days a week for our clients support. * Web Design support: We are also a Web Design Company In Bangladesh. So we provide Web Design and development support for our clients. If need any clients web design and development support, we have web design package for them. If you need, can check here. For above features we are qualified to our valuable clients. We don’t compromise our quality for any situation. We are popular and unique Domain hosting company in Bangladesh.